The first time I tried Cynar was last July at a restaurant in Italy. One day after sightseeing I enjoyed a beautiful dinner outside at Al Mercante, a restaurant located in the center of historical Milan. I had a three hour, four course meal, made up of a caprese salad, spaghetti with clams, black sea bass, lots of bread, and tiramisù for dessert. I was completely stuffed, but the waiter came around one last time to offer a digestif, which was a shot glass full of Cynar (pronounced chee-nahr). Cynar is an Italian liqueur distilled from 13 plants and herbs, artichoke being the most prominent. I gotta say, I didn’t like it at first. In fact, I thought it was disgusting. What turned me on to Cynar was a specialty cocktail at a craft cocktail bar, Rye, located in downtown San Francisco. The cocktail was called “The Stoned Farmer”, and it consisted of Apple Brandy, Sweet Vermouth, Cynar, and bitters—it was absolutely delicious. Like Campari, Cynar is a potable (drinkable) bitter, and it’s definitely an acquired taste (at least for Americans). When you first taste it, it’s sweet, like sweet vermouth, but then you’re hit with bitterness. To me, Cynar doesn’t really taste like artichoke. However, it definitely gives the liqueur a unique, earthy flavor. In Italy they usually enjoy Cynar on the rocks, with soda, or mixed with orange juice. 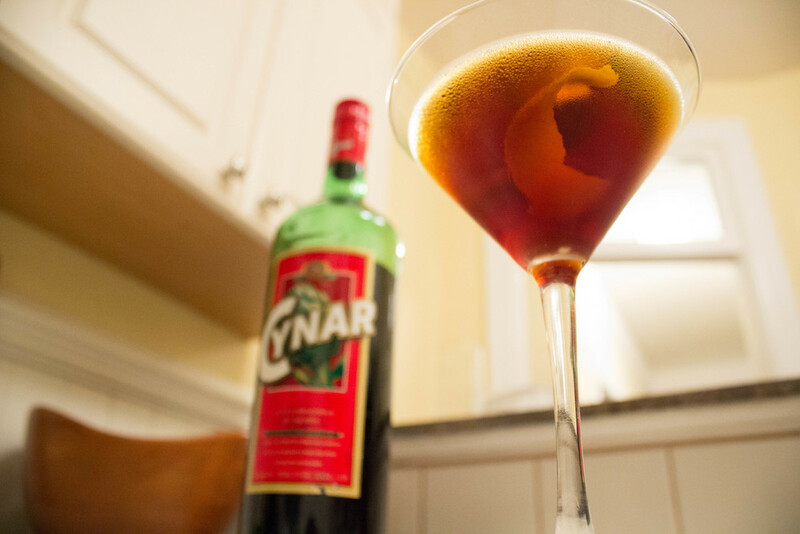 I found that Cynar works great in place of Campari in a Negroni or a Boulevardier. The bitterness of Campari is much sharper than Cynar, so I sometimes also like to add a couple dashes of bitters if I want a little more bite. I also found that just a splash of Cynar can add a bitter-sweet balance to a gin or bourbon-based cocktail. Pick up a bottle and give it a try! Pour all ingredients in a pint glass full of ice, stir, and then strain into cocktail glass. Garnish with lemon peel. Shake all ingredients (except bitters) without ice for about 15 seconds to emulsify the egg. Add ice, shake for another 10 seconds. Double strain into a rocks glass over one large ice cube. Garnish with drops of bitters on top of the egg white foam. Pour all ingredients in a pint glass full of ice, stir, and then strain over one large ice cube in a rocks glass. Garnish with lemon peel. Cheers! Or, as they say in Italy, Cin Cin!